Habitat: Between rocks in humus soil on the limestone slopes. Altitude 1500-2800 m.
Mammillaria avila-camachoi Shurly ex Backeb. 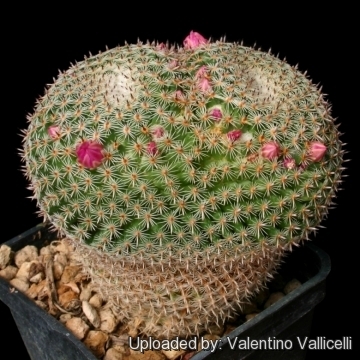 Description: Simple or dichotomicously branched (occasionally ramifies , producing a few basal shoots) with short dense spines. Stem: Symmetrically globose at first, later cylindric, with a depressed apex that appears completely white. 50 - 200 mm high and 50 - 80 mm in diameter, dull green and may, with age, become suberized at its base. Tubercles: Short cylindric/conical firm, 6 - 7 mm long and 2 mm wide, arranged in numerous, very close-set spirals. The Axil is naked or with a little bit wool and bristles. Radial spines: 20 - 30, short, 1 - 3 mm long, somewhat horizontal radiating and arranged laterally on each side of the tubercle, white. 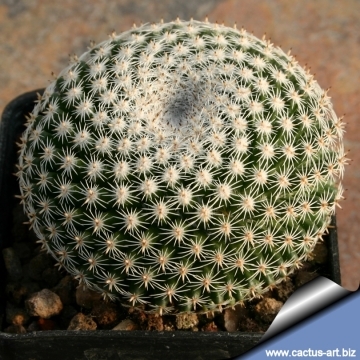 Central spines: 0-1 or usually 2 (but some plant have 4), divergent, one pointing upwards and often longer (up to 5 mm long), the other turned backward, 1-3 mm long, awl-shaped, straight, smooth, thicker at base, they are both brownish with a darker tip. Flowers: Small, funnelform, 10 - 12 mm long and in diameter, purplish pink with darker midstripe. The perianth-segments are narrow-oblong, with an ovate acute tip; the style is longer than the filaments, pinkish; the stigma-lobes are 3, obtuse. 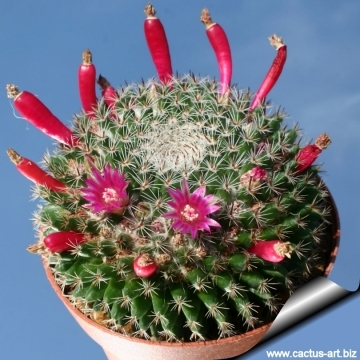 Fruits: Attractively deep dull pinkish-red coloured .Club-shaped, 10 - 15 mm long and 2 - 3 mm wide. Ripens 7 months after flowering. Selfsterile. Seeds: Brown, club-shaped, 1 mm long and 0,8 mm wide. Hilum small and sub-basal. Remarks: There are actually in cultivation several forms of this controversial species. 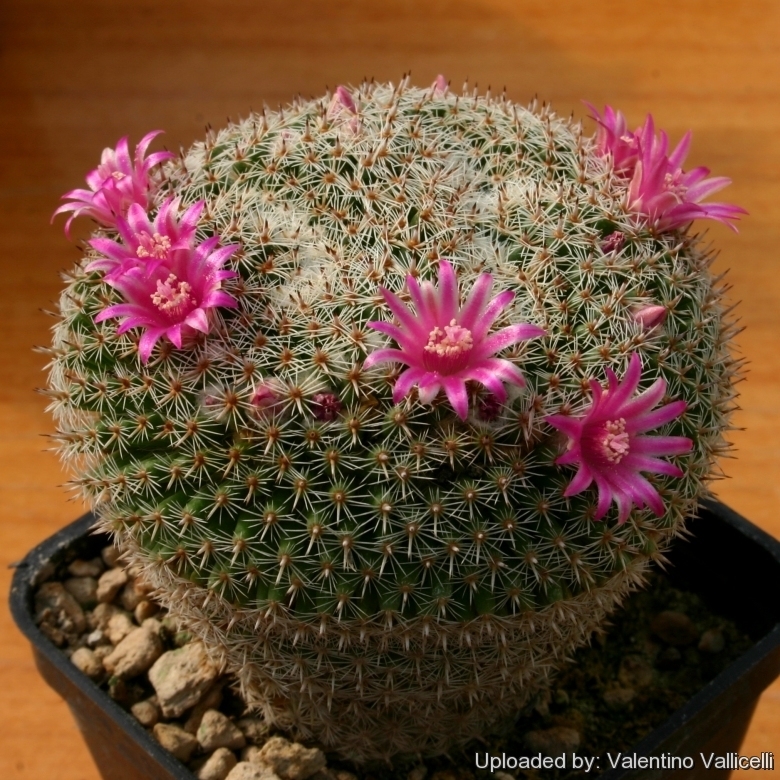 The one labelled Mammillaria pseudoperbella (= Mammillaria perbella lanata?) have usually carmine pink flowers with darker midstripe usually in several complete rings in April-may, with 20-30 setaceous radial spines and abundant axillary wool, while the one identified as M. perbella have sparse purplish pink flowers opening most of the summer with fewer stouter and shorter radial spines. But this division is arbitrary and it is almost impossible to discern the two plant and the many intermediate forms . 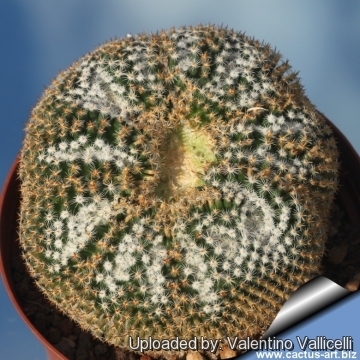 Notes: This is one of the Mammillaria commonly called "Owl Eye Cactus", known for dichotomous branching (forking or dividing into two parts). 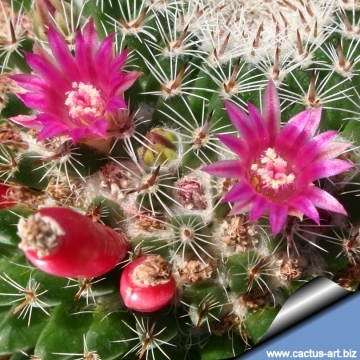 Although dichotomous branching is not a common occurrence in cacti in general, it happens for some reason in this particular species. 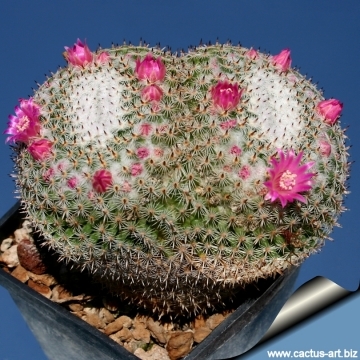 What is interesting about this cactus is that it began as a single head, one head became two, and so on. Other Owl Eye Cactus among others comprise Mammillaria karwnskiana, Mammillaria formosa, Mammillaria microthele and Mammillaria crucigera. 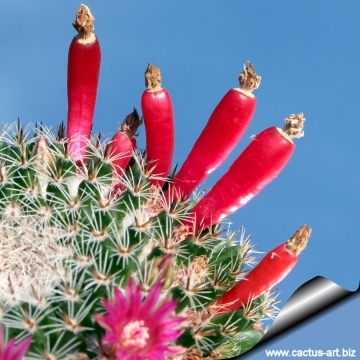 4) Curt Backeberg "Die Cactaceae: Handbuch der Kakteenkunde" 2. Auflage. Band I, Gustav Fischer Verlag, Stuttgart New York 1982, ISBN 3-437-30380-5, S. 233–235. 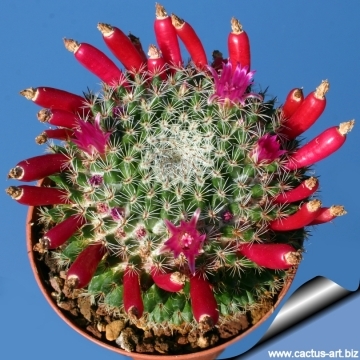 5) N. L. Britton, J. N. Rose: “The Cactaceae. Descriptions and Illustrations of Plants of the Cactus Family.” Vol I, The Carnegie Institution of Washington, Washington 1919, S. 86–87. 6) Urs Eggli, Leonard E. Newton: “Etymological Dictionary of Succulent Plant Names.” Springer, Berlin/Heidelberg 2010, ISBN 978-3-642-05597-3, S. 85. Propagation: It is propagated by seed. Sometimes old plants divide at their apex, ramifying dichotomously - to form two or more distinct joints - but the removal of one of these joints may prove fatal to the plant.